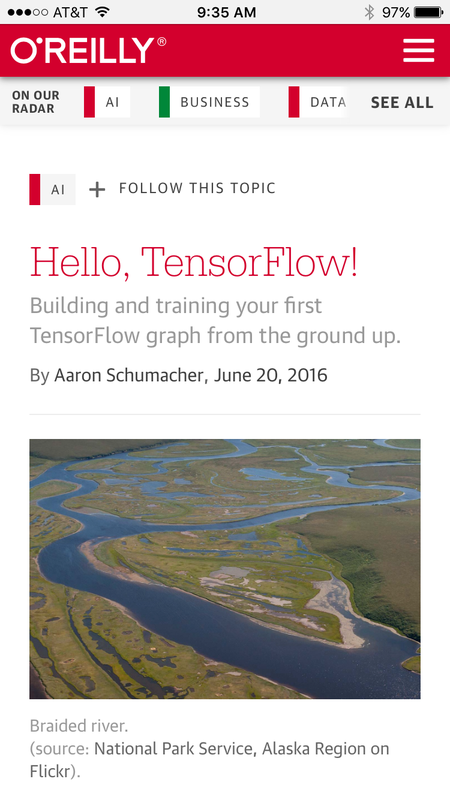 A presentation version of my “Hello, TensorFlow!” O'Reilly post. Given at the TensorFlow Washington DC meetup on Wednesday June 29, 2016, “Deep Dive into TensorFlow” (registration). (slides) (summary with some video) Hello, TensorFlow! is now an interactive code and video Oriole as well. Hi! I'm Aaron. This is my blog and my twitter handle. You can get from one to the other. This presentation and a corresponding write-up (you're reading it) are on my blog (which you're on). This presentation started as a blog post I wrote which was published on O'Reilly about a week and a half ago. If you want you can follow along there and we'll stay pretty close to that content. Also, please interrupt with comments and questions! We're still working on the Oriole version, so your feedback can help others who eventually see that. A lot of people have already contributed to this material. I work at Deep Learning Analytics (DLA) and have to especially thank John for his support, and all my colleagues there for their feedback. I'm also particularly indebted to the DC Machine Learning Journal Club, and of course the folks at O'Reilly. This evening is billed as a “Deep Dive into TensorFlow”. For my part, you can think of it as a deep dive into the shallow end. I'm going to try to show in a very hands-on way some of the details of how TensorFlow works. The idea is not to exercise all the features of TensorFlow but to really understand some of the important underlying concepts. It should be a slightly more hands-on thorough exposition of topics Saba touched on in March. 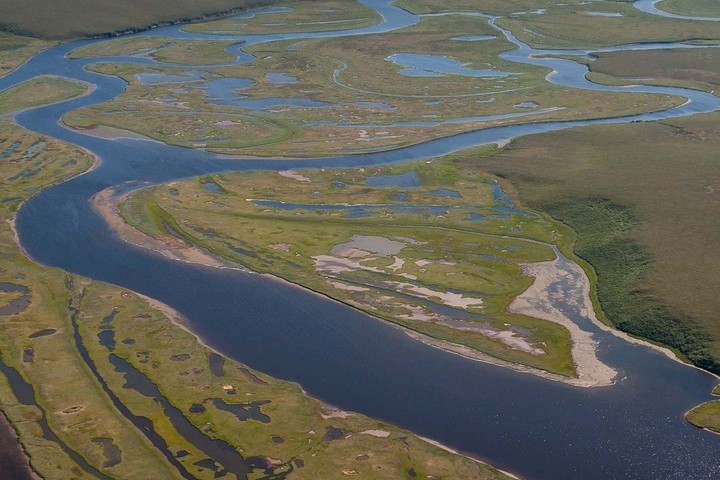 Image from National Park Service, Alaska Region on Flickr. But first, a couple interesting things about TensorFlow. I'm really only going to demonstrate the middle two, but let's mention them all. First thing about TensorFlow: tensors. TensorFlow hates neurons and it loves linear algebra. When you design software you make choices that affect what you can do and how you can do it. 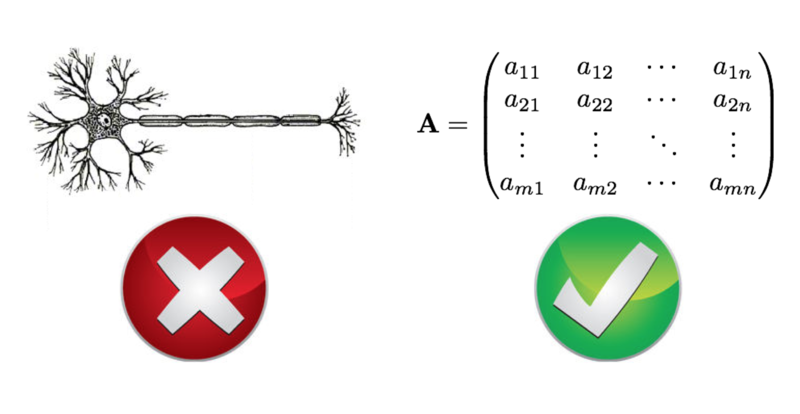 For neural nets, there has in the past been a fixation on the biological metaphor and the "neurons" in particular. If you've used software like R's neuralnet package or Python's PyBrain, you've seen interfaces where you typically define the number of neurons or "hidden units" that you want in each layer, and the connections between them (and perhaps some other components) are set up automatically one way or another. But if you're looking at the math you have to evaluate inside these neural net models, the "neurons" hardly exist at all. The weights on the connections certainly exist, and there are operations that connect values as they flow through the network, but in the end you don't really need "neurons" to be a dominant abstraction in the system. If you go this route, everything is just matrix math - or, for arbitrary dimensions, tensor math. This is the choice TensorFlow makes. It makes TensorFlow really flexible and lets it achieve efficient computation that would be more difficult otherwise. So TensorFlow can do more than "just" neural nets. As demonstrated in the Google/Udacity Deep Learning MOOC, you can implement logistic regression easily with TensorFlow, for example. The linear algebra you actually have to think about is not too tricky, but for our purposes I'm not going to use anything more than individual numbers, so there's no chance of being distracted by linear algebra. The relevant point is that while some other software focuses on neurons and mostly ignores weights, in the case of TensorFlow we focus on weights and mostly ignore neurons as a top-level abstraction. In any event, it's all just numbers. Second thing about TensorFlow: flows. It's important to distinguish between graphs and pictures. Here we mean graphs as in the abstract data type. Data flow graphs. 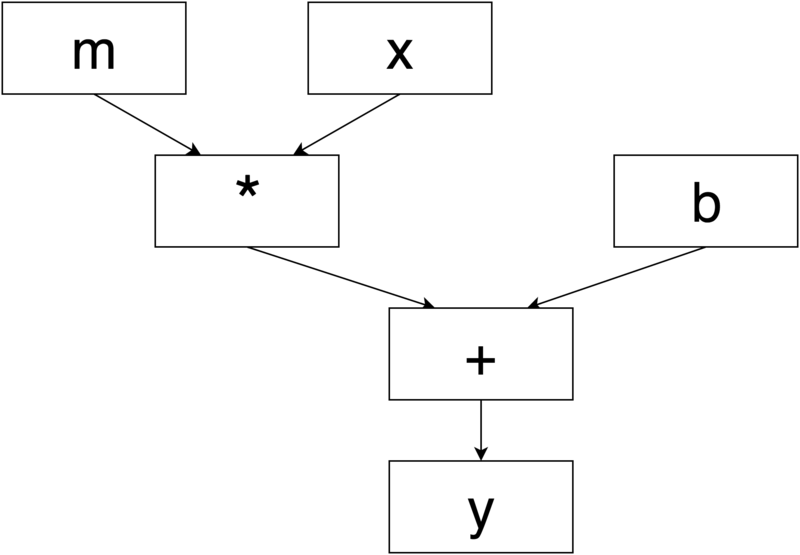 This is a picture of a data flow graph. You might prefer to think of it as \(y=mx+b\). This is what TensorFlow's graphs are like. The advantage of graphs is that the software can manipulate them and "reason about" how to answer questions you're asking before it commits to particular execution paths. For example, Theano works similarly enough to TensorFlow that Keras can use either as its backend. Torch is also similar. Outside of software mostly for deep learning, Spark works with a kind of computation graph to manage distributed processing. Tools like Luigi and Drake manage graph pipelines of data. And many recommend that all data work be thought of as graph-like pipelines. The graph concept is interesting and worth exploring in order to understand TensorFlow, so I'll spend some time with it today. Third thing about TensorFlow: pictures. If you use Python's scikit-learn, you likely also use a separate visualization tool, likely including matplotlib. If you've tried to visualize decision tree rules, you may have had a frustrating time. You may or may not use any explicit logging system at all. The TensorBoard tooling that comes with TensorFlow is a great logging and visualizing system that gives you access to a lot of internals that could otherwise be a lot of work to expose. I think TensorBoard by itself is a compelling reason to use TensorFlow over other similar software. TensorBoard is super great and I will be showing several sides of it today. Image from TensorBoard: Graph Visualization. Fourth thing about TensorFlow: servers. TensorFlow loves moving directly into production. In addition to everything else, TensorFlow has a highly-engineered serving architecture. So if you develop a TensorFlow model on your laptop, you can (relatively) easily build a deployment system to serve that model in a serious way. It seems pretty neat, but I haven't used it and I'm not going to talk more about it. Image from the TensorFlow Serving Architecture Overview. From here to the end is just demo! The starting point is demo_start.ipynb and the ending point (with output) is demo_end.ipynb. This is just me again.